You searched for which does not fit your . We've redirected you to 130-964, which has the proper fitment. Highly recommend! The transitional lens is definitely a huge plus. They are dark on a bright day, the yellow lens brightens things on the overcast days. I personally do not like the yellow lens for night driving. I am more than pleased. Was concerned with two things prior to purchase. 1) The darkness the photochemical would achieve. 2) Seal, size and "right amount" of air intake flow. A1: They get darker than the Ace of spades! Not grey or a weak smoke. A2: Seal and Comfort, Perfect. Been running them at 33° to 60°. No alagator tears. No strain. Size is nice too. Eyebrows to temples to upper ridge of cheekbones. Would comment on the amber side but if your not sold on amber for night riding yet not much I can tell you. Meh -- You get what you pay for. 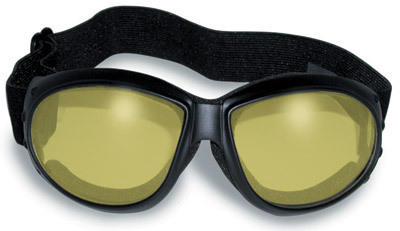 The lenses are better than good, but the cheap foam instead of a quality seal where the lenses seal to the face mak them a inferior eye protection.